The trailer for the new TNT series The Alienist, starring Luke Evans, has been released! Luke stars alongside Daniel Bruhl and Dakota Fanning in the psychological thriller, set to premiere on January 22. 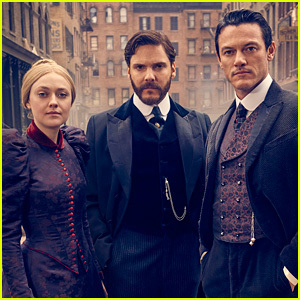 The Alienist opens when a series of haunting, gruesome murders of boy prostitutes grips New York City. Newly appointed police commissioner Theodore Roosevelt (Brian Geraghty) calls upon criminal psychologist (aka alienist) Dr. Laszlo Kreizler (Bruhl) and newspaper illustrator John Moore (Evans) to conduct the investigation in secret. 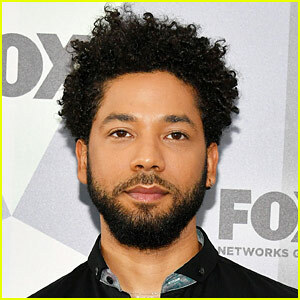 They are joined by Sara Howard (Fanning), a headstrong secretary determined to become the city’s first female police detective. Using the emerging disciplines of psychology and early forensic investigation techniques, this band of social outsiders set out to find and apprehend one of New York City’s first serial killers. Jessica Chastain looks gorgeous in a blue dress at a special screening of The Zookeeper’s Wife on Tuesday night (March 7) in Warsaw, Poland. The Oscar-nominated actress was all smiles earlier in the day while getting to visit the historic zoo in Warsaw, where her movie is based. The film tells the real-life story of one working wife and mother who became a hero to hundreds during World War II. In 1939 Poland, Antonina Żabińska (Chastain) and her husband, Dr. Jan Żabiński, have the Warsaw Zoo flourishing under his stewardship and her care. When their country is invaded by the Germans, Jan and Antonina are stunned – and forced to report to the Reich’s newly appointed chief zoologist, Lutz Heck (Daniel Bruhl). To fight back on their own terms, Antonina and Jan covertly begin working with the Resistance – and put into action plans to save lives out of what has become the Warsaw Ghetto, with Antonina putting herself and even her children at great risk. Daniel was also in attendance at the screening! FYI: Jessica is wearing an Antonio Berardi dress, Christian Louboutin shoes, and Piaget jewelry. Suki Waterhouse & Armie Hammer Celebrate Berlin Film Fest Opening Night At Bulgari Party! Suki Waterhouse rocks a jumpsuit with a plunging neckline while attending Bulgari’s Night of the Legend Party held as part of the 2017 Berlinale International Film Festival at the Soho House in Berlin-Mitte on Thursday (February 9) in Berlin, Germany. The 25-year-old actress/model was joined by Lottie Moss (sister of Kate), Toni Garrn, Armie Hammer, Daniel Bruhl and his girlfriend Felicitas Rombold, Italian actor Giulio Berruti and Princess Lilly zu Sayn Wittgenstein-Berleburg. At the party, Bulgari brand ambassador Princess Lilly zu Sayn Wittgenstein-Berleburg and Bulgari managing director Sandra Mohsni invited guests to discover the revolutionary design of the B.zero1 ring, as it debuts in Germany. Suki has recently been spotted holding hands, kissing, and getting a little handsy with Star Wars: Rogue One star Diego Luna. 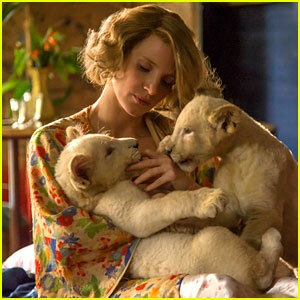 Jessica Chastain stars in the beautiful first trailer for The Zookeeper’s Wife. The film follows the real-life story of one working wife and mother who became a hero to hundreds during World War II. In 1939 Poland, Antonina Żabińska (Chastain) and her husband, Dr. Jan Żabiński (Johan Heldenbergh), have the Warsaw Zoo flourishing under his stewardship and her care. When their country is invaded by the Nazis, Jan and Antonina are stunned – and forced to report to the Reich’s newly appointed chief zoologist, Lutz Heck (Daniel Brühl). To fight back on their own terms, Antonina and Jan covertly begin working with the Resistance – and put into action plans to save lives out of what has become the Warsaw Ghetto, with Antonina putting herself and even her children at great risk. Look out for the film on March 31, 2017. 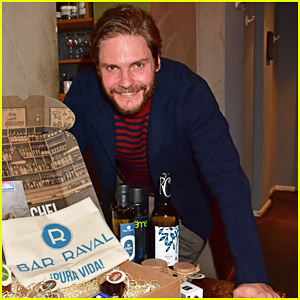 Daniel Bruhl Celebrates Launch Of Bar Raval Online! Daniel Bruhl is all smiles while attending his Bar Raval Online Shop Launch Celebration held on Wednesday (October 5) in Berlin, Germany. The 38-year-old Captain America: Civil War star presented his brand new tastefully blended Tapas boxes in front of a selected group of friends and business partners. “The Big-seizure-exquisite-box or High-Noon-apéritivo tapas box is perfectly fine, the potato chip bag easy to tear, to scatter our mussels and sauce over it and to the sole benefit to focus,” Daniel expressed. “It’s the high standard of Spanish favorite products”. Check out more at barraval.com!